Our Rastakhan’s Rumble Aggro Odd Mage deck list guide will help you learn how to better pilot this deck. Our guide features mulligan, play, and card replacement strategies! 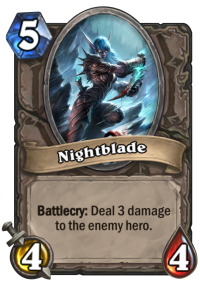 While the lists of Odd Mage, up to this point, have been focused on using the upgraded hero power to deal with early threats, using spells like Dragon's Fury and Flamestrike to transition to Frost Lich Jaina in the late-game, this relatively new list is turning the idea of Odd Mage on its head and uses it as a more versatile Hunter hero power. The list uses the usual, early-game minions, such as Dire Mole and Fire Fly, to get on the board, taking advantage of the class’ powerful low-cost spells Arcane Missiles and Cinderstorm to push damage. 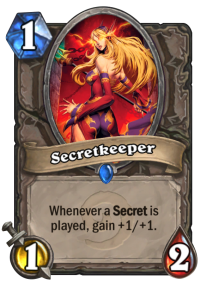 Of course, if you’re playing an aggressive Mage deck, you can’t go anywhere without including powerful secrets, like Explosive Runes, which will usually remove the opponent’s next minion and, at the same time, push damage to the face, and Counterspell, that can make the opponent waste an entire turn doing nothing. After the early game is done, cards like Daring Fire-Eater and Clockwork Automaton can provide huge potential for bursting the opponent on consecutive turns, while the new legendary Jan'alai, the Dragonhawk brings back an old, familiar face, in Ragnaros the Firelord, that can close out games, especially if it is not removed immediately. Find more versions of this deck type on our Aggro Odd Mage archetype page! Daring Fire-Eater: With a cost of just 1 mana, this creature’s Battlecry lets you deal 4 damage with a single hero power, provided you use it during the same turn. It’s a great tool to remove some of the opponent’s bigger threats, while also serving as a burst for the opponent’s health. Secretkeeper: Although the deck cannot play a secret until turn 3 (or turn 2 with The Coin), this minion’s power is on display against Hunter decks that seek to play a lot of secrets. 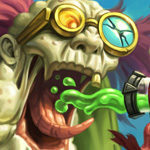 The 2 health points give it a bit of an edge against most 1-drops, since you can use your hero power to trade up. Black Cat: A solid 3-drop, this minion lets you draw a card when you play it, while also giving you an extra damage on your spells, Arcane Missiles, Cinderstorm and Explosive Runes. Pyromaniac: A new addition to the Mage class, this rare minion lets you draw a card whenever your hero power kills a minion. Its 3/4 statline just amplifies the card’s power, since it’s pretty difficult to remove on curve. Stargazer Luna: A uniquely-designed card, this legendary lets you draw a card whenever you play the right-most card from your hand. With the deck being somewhat early-focused, this means that you can really get ahead in cards and dig for your answers, while its 4 health makes it especially hard to remove on curve. Leeroy Jenkins: No aggressive deck is complete without this iconic charger. 6 damage for 5 mana is a pretty good deal! 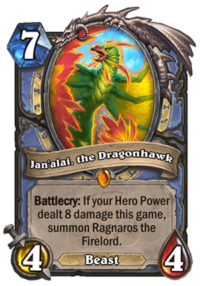 Jan'alai, the Dragonhawk: Ragnaros the Firelord is back, again! This time it’s the Mage class that gets to resurrect this old friend, but rather than giving up a defensive ability, you don’t really give up anything, since the card just requires you to deal 8 total damage with your hero power (4 normal ones with Baku the Mooneater). The fact you get a 4/4 with your Ragnaros the Firelord is also a plus, but, contrary to the Warrior effect, this one can be dealt with. Baku the Mooneater: This is the deck’s defining card, as the deck does not work without it. There are not a lot of aggressive decks that can kill you fast enough with this deck. Odd Paladin is your worst matchup, but other than that, you only need a small amount of damage from your early-game minions and your hero power can do the rest. Explosive Runes can really take a toll on your opponent, since most aggressive decks tend to play minions with low health, which lets you push more damage to the face, while also removing their threat. This is where the hero power really shines. With cards like Daring Fire-Eater and Clockwork Automaton, you only need a couple of hits from your first few minions and you can start pressuring the opponent every single turn. 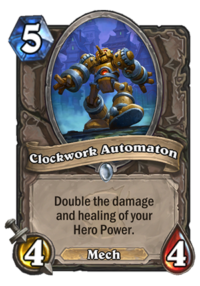 It should be noted again, that those two effects stack, so if you play Daring Fire-Eater with a Clockwork Automaton on the board, your hero power will deal 8(!) damage. In these matchups, most of the time, you’re going to use Jan'alai, the Dragonhawk or Leeroy Jenkins as a finisher, provided there are no taunts in the way for the latter. There is a fine line between the time you need to be looking to control the board and the time you should be pushing everything to face. Learning the burst potential of the deck and deciding on the best time to go all-in can make all the difference in the world. As people are still adjusting to the meta, a good amount of them will not be familiar with the deck’s damage. Holding on to certain combos, like Daring Fire-Eater + Clockwork Automaton, can catch them off guard, if they are greedy and don’t heal soon enough. Timing your Counterspell well can prove crucial, since most removal is pretty expensive, such as Psychic Scream, and can cost your opponent an entire turn. Arcane Missiles and Cinderstorm are especially good against Odd Paladin, wiping their early board, giving you a few extra turns of face damage with your minions and forcing them to play defensive. While Stargazer Luna‘s effect is pretty strong, if you can’t make her stick to the board long enough for it to matter, you should consider the immediate draw effect of Arcane Intellect, so you can dig through your deck quicker. 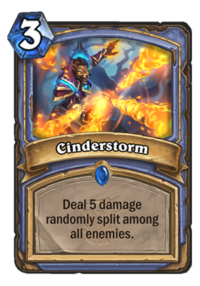 If you run into too many slow decks or other, similar Odd Mage lists, cutting the damage of one Nightblade for an extra copy of Counterspell can go a long way to help you in those matchups. If aggressive decks are what is slowing your climb, these changes will make your deck a lot more early and minion-focused (and more affordable), while preserving a good amount of burst. This way your first couple of turns will be a lot more consistent, allowing you to keep pace on the board, until you can hero power them to death. With the hit to the Hunter decks, through the nerf of Lesser Emerald Spellstone, Mage has quickly gone from defensive to aggressive. Learning to tread the line between using the hero power to protect your minions and starting to pressure the opponent’s health is what can make the difference in your climb, but with only Odd Paladin being fast enough to outrace it, this deck is quickly becoming a favorite to take the top spot of the meta, due to the versatility of its hero power. I’m enjoying this deck specially the list with Subject 9; it’s easy to drive but hard to master. I think this deck will find some optimizations in next weeks to get a spot on Tier 2 or maybe Tier 1.